SocialEyes, a new startup co-founded by RealNetworks chairman Rob Glaser, is launching today at DEMO with the promise of making video chat truly social by leveraging Facebook Connect. The San Francisco company is building a video messaging platform that tries to move beyond largely one-to-one or group chatting experiences and looks like something Facebook would make it if went after video chatting. The service, which will live as its own site and as a Facebook application, allows users to carry on multiple chats throughout the day and lets people tap Facebook’s social graph for conversations. Users can pop in and out of individual chats or combine them together in group sessions called scrums. Users can also join or start their own private groups among friends or participate in public groups based around hobbies and interests. When users aren’t able to communicate in real-time via video chat or instant messaging, they can send video messages to friends. A record of a user’s communications is captured in a feed tab. Launched last year, SocialEyes has raised $5.1 million in an $600,000 angel round and a Series A led by Ignition Partners. Co-founder and CEO Rob Williams, a Microsoft (s msft) veteran who previously founded instant messaging start-up Avogadro, said the promise of SocialEyes is in its open style of communication, which reflects the way people interact and collaborate. He said building off Facebook’s social graph extends the reach of video chatting and makes it more personal. It’s a way to connect the virtual world with the real world, and Facebook is a good platform for face-to-face video chats because of its emphasis on using your real name and identity. The video chat space has gotten busy. Skype last year enabled group video chats, deep Facebook integration and mobile video conferencing. Apple (s aapl) earlier this month release a full version of FaceTime for the Mac. Other start-ups such as PalTalk have also tried to make video chatting more social with group conversations of up to 10 people. The biggest name to watch is Facebook, which is likely to jump into the video chat space at some point. It recently upgraded its messaging system, and the next obvious step would be video chat, which could undercut services like SocialEyes and other apps built on Facebook. Video chatting can be intensely personal, but so far, its reach is limited by smaller networks and slower consumer adoption. Skype has shown some of the most success with video chat: about 40 percent of its calls are now video calls. But a native Facebook video conferencing feature could make the whole process of communicating through video more mainstream. 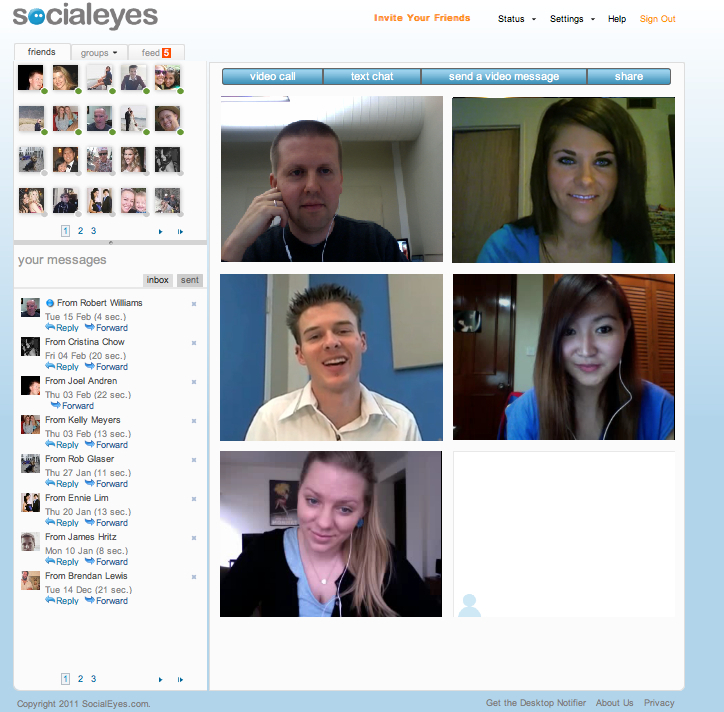 Startups like SocialEyes are showing how video chat can be that much more social. Now we’ll see if Facebook is taking notes. Ryan, here I sat down with Rob and Rob to get a demo of SocialEyes and a look back at more than a decade of Internet videoconferencing history: http://www.youtube.com/watch?v=2SAOCwkhitQ feel free to embed any of our videos into your posts. Thanks! This looks interesting but I’m not sure video chat is for everyone the way the social graph is. And please, help me! I’m a new one here, and I haven’t adapted here yet! Can I receive news from this cite on my e-mail?